Okay, now there’s no more excuse why you can’t take it with you. Whether it’s your data, your recipes, your photos, whatever! This Tuff-‘N’-Tiny USB Drive is so small, lightweight, durable, secure ,and inexpensive, that there’s nothing to hold you back. I couldn’t believe how tiny this thing was the first time I saw it. Actually my thumb can cover the entire device. Thank goodness it comes with a handy lanyard to put it on your keying or to attach it to your bag of choice. The lanyard and ring, while quite small, seem very durable. 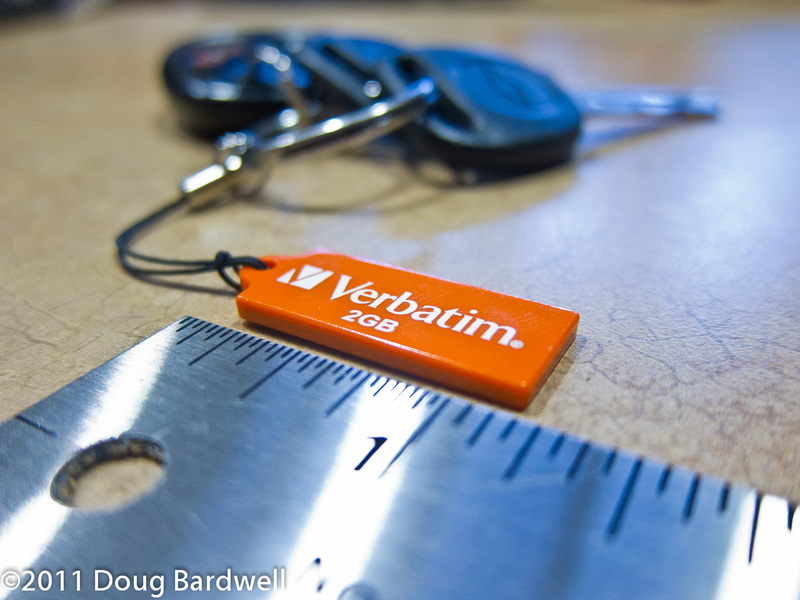 While Verbatim has been turning out amazing products for 40 years now, they have incorporated what they call SIP (system in package) technology to pack more data into the smallest possible form factor. Drives are available in 2GB, 4GB, 8GB,16GB and 32GB sizes. They come in five colors: Red, Orange, Green, Purple and Black, depending on capacity. Not only are they super small, they are never-the-less ultra-rugged as well; resistant to water, dust and static discharge. I’ve been carrying it on my key ring and even though I know it’s getting occasionally scratched in my pocket, it’s never failed to work perfectly. It’s even gotten a soaking once during an unexpected downpour, with no ill effects. They claim it’s impermeable to moisture and it looks like they are right. The instructions merely suggest making sure it’s dry before using it again. Included on the device (for Windows users) is special software to encrypt part of the drive with your secure files. Before you start loading the drive, decide how much space you wish to devote to secured storage and the software will partition it for you. By using the security software, the drive is renamed to ‘Public Zone’ and your private partition is totally hidden. What you do see is a special executable file, which when clicked, prompts you for your password, and opens a new window displaying your ‘PrivacyZone’. This system works well with Windows Explorer, but I did encounter some issues trying to use it with alternate file managers like Xplorer2. So now, no more excuses for not carrying all those precious digital files and photos when you traipse off to Grandma’s house. It takes up less space than one more key on your key ring, and it can be the key to your digital life. You can purchase it online at their web store.